I will be at Belfast exposed this coming Thursday 5th february for a workshop – spaces limited but click the pic below to find out more information and see if their is availability. Below is the invitation for the Photobook Club New York’s end-of-year meetup; a time to reflect on the photobooks of 2012 and enjoy a drink with other photobook lovers. End of the year photobook meet-up in New York! It is a perfect time to look at the photobooks published in 2012. Join us on Saturday evening to enjoy photobooks, celebrate “winter” and have a glass wine. Please bring a book published in 2012. This event is possible thanks to the support of Ten10 Studios, art space and photography studio in Long Island City. Just received a message from Photobook Club NY organizer and all round photobook-force-for-good Helka Aleksdottir about an awesome event called 10X10 Japanese photobooks which is being supported by the ICP Library and the Photobook Facebook group. In a nutshell the event is split into a physical (NYC) and virtual element, both featuring 100 Japanese photobooks recommended by 10 writers/curators/critics. What makes this event exciting is not only that those outside NYC can be involved through the 100 online suggestions but also that, for those in New York they can get hands-on and explore the books for themselves in a dedicated reading room. The press release is linked here for a much more detailed account with addressees etc. This past weekend the Photobook Club New York held their third meetup, this time themed around the Japanese photobook with some fantastic, rare, and fantastically rare books being shown and shared by the group. Luckily for all who could not attend, organiser Helka Aleksdóttir has a full article on the event on her Phot(o)lia blog. And if you are interested in attending the next PBC- NY event, then sign up here. Our third photobook meet-up took place last Saturday evening and was focused on Japan. Russet Lederman and Jeff Gutterman were our special guests and shared gems from their incredible collection of Japanese photobooks. They have been collecting photoboks for over 10 years and have a lot to share. What a great presentation and a show of books it was! Several images are shown below from the talented Mathieu Asselin, more available via the full article. – Spent time away from the keyboard documenting the beautiful and deadly Cat and Fiddle road in the Peak District, i’ll be spending more time there later in the year with a view to a publication 2012/13. Found this tree by the side of the road approaching Macclesfield..
– Since the release of the Photobook Club iBook looking at Ken Schles’ ‘Invisible City’ I have been working to make it available on more platforms in the form of an ePub and interactive PDF. Getting close now but finishing touches making sure it is built for other devices rather than directly ported. – We will next be looking at the above book although with the ‘Cat and Fiddle’, ePub and more away-from-keyboard time in August we might take a this one at a more leisurely pace! Saturday just gone saw the second New York Photobook Meetup organized by the wonderful Helka Aleksdóttir and featuring none other than Ken Schles (with whom we spent a great month last year looking at ‘Invisible City’). As if this wasn’t enough, Aperture’s Lesley Martin also attended and brought with her some sneak preview copies of the latest ‘Photobook Review‘ newspaper. For a full ‘report’ of the event head over to Helka’s blog here. Meetup in Madrid on Tuesday, Meetup in NY last night! Just a quick reminder to anyone who is in Madrid on Tuesday night and loves photobooks, get yourself to the inaugural Photo Book Club Madrid event. All the details can be found at the bottom of this post in Spanish and a perhaps poor English translation, or by clicking here and heading to the Facebook page! In other meetup related news – Last night Helka Aleksdóttir organized and hosted a meetup in New York which seems to have been a great success, head over to the photobook facebook group that Helka runs for more information, but for now a picture of the event. Oli’s Meetup in NY was great!, lots of beautiful books, people and a nice screening of the documentary “How to make Books with Steidl… More meetups coming soon. keep posted on Photobook Group on FB. If and when more meetups take place in NY, I shall post details here and send out to all on the newsletter list. 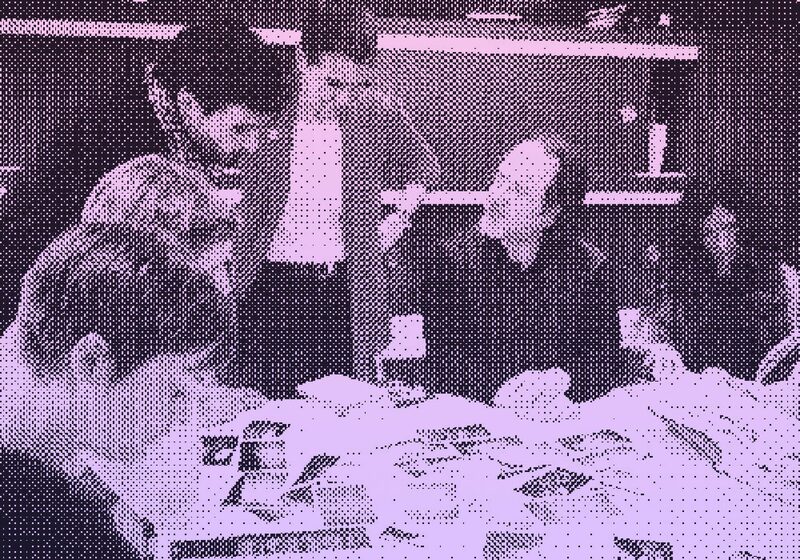 Como es la primera reunión todo el que quiera asistir trae un fotolibro que le apasione para compartirlo con los demás. Entre todos hablaremos de ellos compartiendo una tarde alrededor de una mesa y unos cafés. La entrada es libre, no cuesta nada, no hace falta avisar y no es necesario ser socio de la RSF. Por favor, sed puntuales. Os esperamos con café calentito. 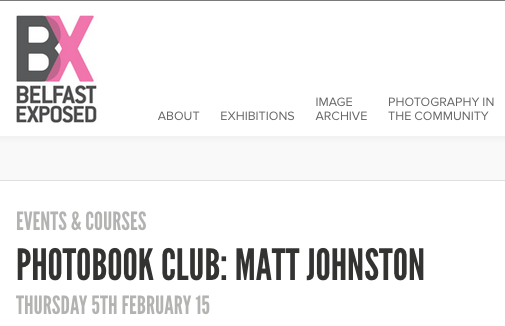 PhotoBook Club Madrid meeting 01 Tuesday, February 28, 2012 19: 00 h. in the Royal Society photo as the first meeting is anyone who wants to attend brings a photobook that you passion to share with others. Together we will talk about them sharing an evening around a table and a few cafes. Admission is free, costs nothing, there is no need to notify and don’t need to be a member of the RSF. Please be punctual. I hope with warm coffee. Great news for photobook lovers in New York – Helka Aleksdóttir is running a meet next weekend on Saturday 25th in Brooklyn. For more information on the event and to RSVP (as space is limited) please head over to the event page here. Yesterday we celebrated a special session: Photo+gastronomic+book Club at Elgoibar ( close to San Sebastián). It was gastronomic because after sharing books, we also had lunch together. 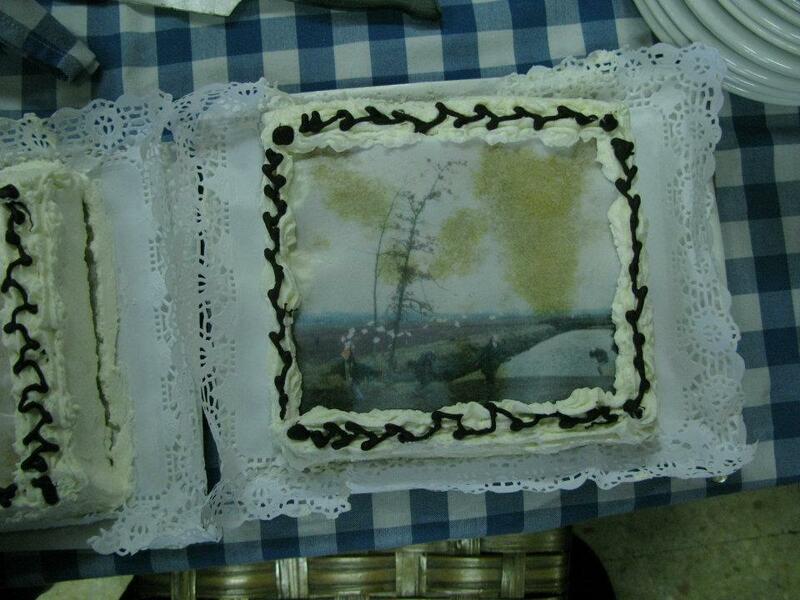 We had a “photographic menu”, first a Fontcuberta Soup (it look like a chicken soup but it wasn’t…), an Elliot Erwitt black and white rice, Gregory Crewdson sorbet and a Jeff Wall cake. We had a great time, participants brought great books, such as Ortiz Echagüe’s Tipos y Trajes published in 1957. Next Wednesday 29 at 19:30 we will have our regular meet-up in Bcn, this time there wont be a guest but instead a screening of the documentary “How to make a book with Steidl”. So, we will be seeing the movie, talking about it and discussing about photobooks that were made by editors instead of photographers. If you want to get to one of the Photo Book Club Barcelona’s regular meetings (and why wouldn’t you?) you can get in touch via their Facebook page here. Although the spaces on this meetup organized by Joerg Colberg, Noah Kalina and Bryan Formhals went like, hot, hot, chocolate cakes, it’s great to see so many meetings start to take place around the world for the photo-bibliophiles. And so below you can read what they are planning, although this may only increase frustration at not being able to attend! Here’s hoping more are organized in NY soon! 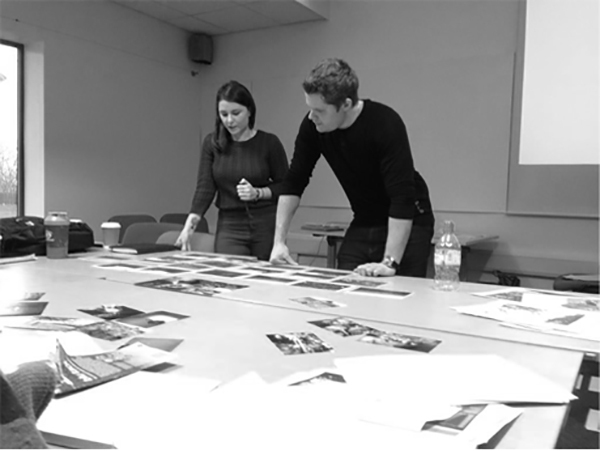 The pitch: There has never been a better time for the photobook. Hundreds, if not thousands, are currently made every year. How to keep up? How and where to see photobooks? This is where Photobook Meetup New York steps in: You pick a book – any book you want (but not one you made or produced) – and you bring it to the inaugural meetup, to briefly present it, talk about it. Five minutes, just you and the book (no fancy presentation, no projections or anything like that). Everybody else will simply listen, maybe ask questions, and look. If twenty people show up at the end of the night everybody will have seen 19 presentations of photobooks. Maybe you’ll know some of the books, but you might not know the different perspective or take you’ll hear. Maybe you have never heard of some of the books. Anything is possible. 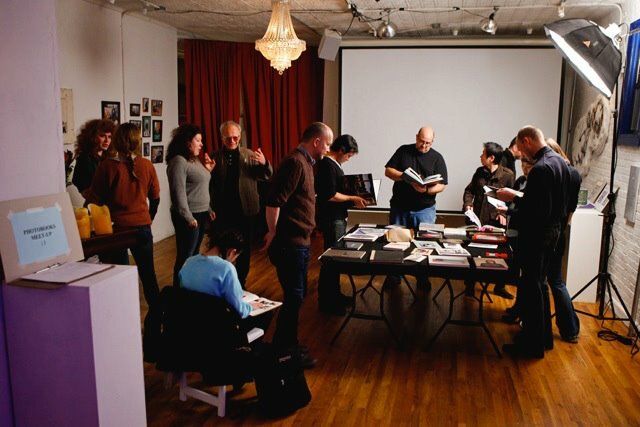 Photobook Meetup New York is about the photobook as much as it is about the community of people who love looking at and discovering new books.